Western blot analysis of whole cell lysates probed with PSD95 antibody followed by detection with HRP conjugated Goat anti Mouse IgG antibody (1/10,000, STAR207P) and visualized on the ChemiDoc™ MP with 2 second exposure. Arrow points to PSD95 (molecular weight 95 kDa). Mouse anti-human PSD95 antibody recognizes disks large homolog 4, also known as Tax interaction protein 15, post-synaptic density protein 95 or synapse-associated protein 90. This antibody has been extensively validated for western blotting using whole cell lysates. Mouse anti Human PSD95 antibody recognizes PSD95, also known as DLG4, tax interaction protein 15, postsynaptic density protein 95 or synapse-associated protein 90. The DLG4 gene encodes a member of the membrane-associated guanylate kinase (MAGUK) family. It heteromultimerizes with another MAGUK protein, DLG2, and is recruited into NMDA receptor and potassium channel clusters. These two MAGUK proteins may interact at postsynaptic sites to form a multimeric scaffold for the clustering of receptors, ion channels, and associated signaling proteins. Multiple transcript variants encoding different isoforms have been found for DLG4 (provided by RefSeq, Jul 2008). 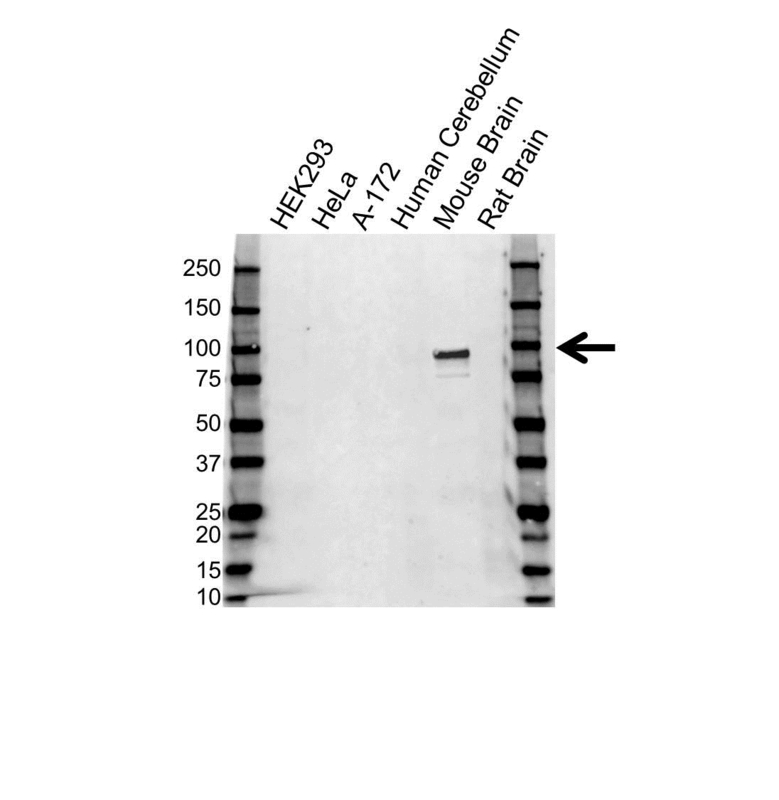 Mouse anti Human PSD95 antibody detects a band of 95 kDa. The antibody has been extensively validated for western blotting using tissue and whole cell lysates.